We as women are led to believe that not only can we do it all, but that if we're not doing it all, then something is wrong with us. Today, I want to let you know ... you CAN'T do it all. Something has to give. So, how do we survive when the expectation is that we can do it all? First, we need to be alright with the fact that we can't do it all. No guilt. We can't allow a false premise to keep us down. We also must prioritize. If we can't do everything, we must decide what must be done and what things we can just let things slide. This goes back to saying no when you need to. We also need to know our limits. We shouldn't push ourselves so much that we crash. Most importantly, we need to adjust our expectations. We need to quit expecting that we can do everything. 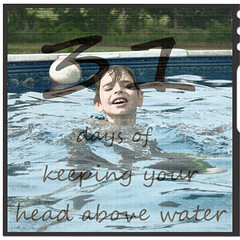 Realizing that you can't do it all can help you keep your head above water.